Wondering what family friendly Easter events & activites are happeing around Edmonton? Get all the details below. Hop into Bonnie Doon for photos with the Easter Bunny from April 12-20, 2019. Photos will take place at our Easter set in the promo court. Get your pictures taken with the Easter Bunny. If you have a pet bring them on April 17th to have their photo taken with the Easter Bunny too! Hop on over to Londonderry for photos with The Easter Bunny and The Spring Fairy! Hippity hoppity hooray – the Easter bunny is here! Join us on Centre Stage for photos with the Easter Bunny. Activities include bouncy castles, face painting and more! Plus, go on the Easter Egg Hunt and enter for a chance to win a grand prize valued at $500! Photos with the Easter Bunny, Easter Egg hunt, face painting and more. Capture the memories of your little ones with a free photography mini session. Photos will be Spring / Easter themed and we’ll also have cute and cuddly bunnies for the kids to get their photo taken with. Children will get approximately 3-5 minutes with the photographer and you’ll be provided with a code to go online to view the photos, download and print. Family activities include a bunny petting zoo, face painting, scavenger hunt, and more. Come join us for a morning of free Easter fun. There will be an Easter Egg Hunt, craft activities and snacks. Edmonton’s biggest Easter egg hunt is back in Lewis Farms! Bring your friends, family, and neighbours for FREE food, carnival games, big prizes, and much more! The hunt will commence promptly at 10 am and will be followed by some games, activities and snacks for the kids. Don’t forget to bring your own basket! Your children will have a great adventure searching our grounds for colourful eggs to trade for Easter goodies. Then there is cookie decorating and egg dyeing and a special fuzzy guest. This year for the parents, we have added a Spring Family Market to enjoy a little shopping. 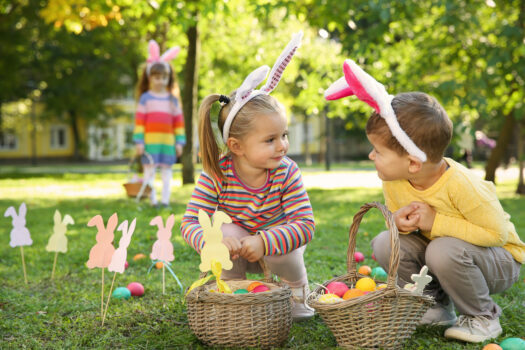 Bring your basket for the Easter Egg Hunt, burn off some energy on the gymnastics equipment, and other activities like a bouncy house, glitter tattoos, and more. Bring Your Own Basket and visit over 20 shops at Currents of Windermere for some FREE Easter treats! The Easter Bunny will be waiting in Currents Town Square to take some free photos with you too! You’re invited to WELCA’s Easter Party which will include Easter Bonnet Contest with the Horses, scavenger hunt, poodle noodle horse races, crafts, and more. Family-Style Easter Brunch served over easy from 10 am to 2 pm on Sunday, April 21. Our family-friendly, crafted menu includes a delicious selection of breakfast classics and favourites – all served family style for groups of 2 or more. Join us for an Easter Egg Hunt in our greenhouse where we will be hiding plastic eggs in our plants, each with tickets inside. At the end of the hunt, kids will be able to exchange their tickets for a surprise! 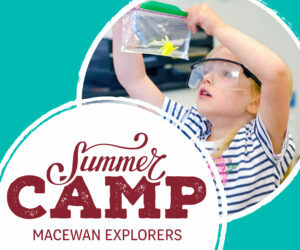 Other activities also include story time, crafts, and animals on site. Explore the pyramids and take part in family-friendly friendly activities. Plant an Easter themed plant and meet some furry friends down at the Muttart.